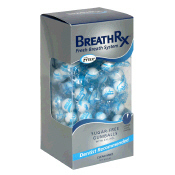 BreathRx Sugar-Free Mints deliver a powerful breath cleansing you won't get from any other breath mints. ZYTEX(R), an exclusive complex, delivers a powerful burst that cleanses the mouth, neutralizes odor and helps prevent bad breath. BreathRx mints are designed to attack bad breath at the source and not just cover up odors with flavoring. Feel what clean, healthy breath is really like with BreathRx Sugar-Free Mints! Imagine... what just one spritz can do! Start taking control of your breath today! The BreathRx Starter Kit gives you a total breath management solution so you can take control of your bad breath. Each kit has the essential products you need to integrate the simple 3-Step, Brush-Scrape-Rinse routine into your daily hygiene regimen. BreathRx is 100% alcohol free and sugar free. ZYTEX®, found in all BreathRx products, gives bad breath a one-two punch with anti-bacterial essential oils that kill bacteria that cause bad breath and zinc that neutralizes the odors already created by these odor-causing bacteria. With the BreathRx Starter Kit, you've got nothing to lose but your bad breath! Contains (1) Purifying Toothpaste- 4oz tube, (2) Gentle Tongue Scrapers, (1) Anti-Bacterial Tongue Spray- 2oz bottle, and (1) Anti-Bacterial Mouth Rinse- 8 fl oz. The exclusive BreathRx dual-action rinse formula eliminates oral malodor in two phases. First, its powerful active ingredient kills the bacteria that cause bad breath, then Zinc keeps working throughout the day to neutralize the odor caused by these bacteria- Volatile Sulfur Compounds (VSCs). Nothing leaves your breath fresher longer. Plus, it's 100% alcohol free, so it has none of the harmful and mouth-drying affects of alcohol. Twin pack design allows for one spray in your car and one in your purse or office!